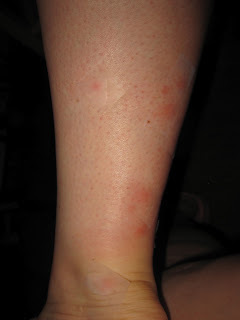 During our camping trip last summer I got an excessive number of mosquito bites on my legs, upwards of 25 on each leg. The main thing I learned from that was that it’s important to use a reasonable amount of bug spray, especially when it’s hot out and you’re wearing shorts. Around here we have mosquitoes that carry diseases, so insect repellant isn’t really something to mess with. We’re experimenting with different repellents but we have yet to be happy enough with one to recommend it. to see scotch tape on some of them. 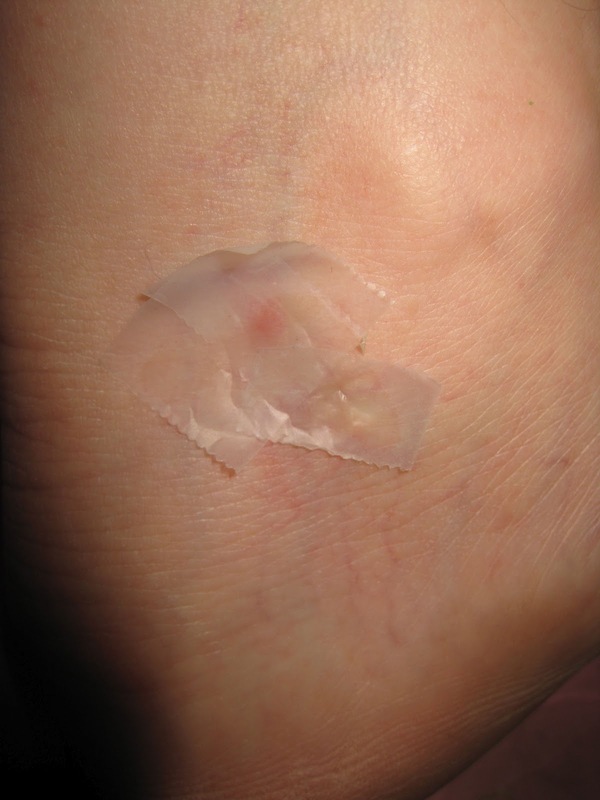 However, once I had the bites, I decided that this was a great opportunity to try a variety of natural mosquito bite treatments and see what worked best. I’ve started to pay attention to what’s in the topical products we put on ourselves and our children, because you absorb chemicals through your skin and beauty products are not regulated the way food is. I poked around on the web to get ideas of natural remedies that I could try. I found that vinegar provided instant relief – I dabbed it on with a cotton ball. Baking soda in a paste with water worked for a little while, but left white patches on my skin that brushed off easily – and when they brushed off, the itching returned. To sleep I took benedryl and my usual loratadine in addition to my natural remedies. I took baking soda paste with me to work and reapplied it throughout the day, but by about 3 o’clock I was ready to go out to the store to buy something else to try. That prompted another google search which came up with many ideas, including putting scotch tape on them. Since I had scotch tape in my desk drawer, I tried it. The tape worked surprisingly well. When I got home that evening my 1 year old was picking at my leg and I finally realized he was pulling the little pieces of tape off the bites. I had forgotten all about them! When the tape came off, the itching came back. By this point I was getting fairly frustrated by the bites so even though it’s not a natural remedy, I started putting hydrocortisone cream on the bites, a prescription, 3% tube that I had. This helped, but did not provide any instant relief, so it needed to be paired with something else. The toothpaste worked right away, it worked for a long time and it is pretty convenient. The only drawback was that it leaves a spot of white or green that others can see. Since we’ve discovered this my children have gotten in the habit of asking for toothpaste when their bug bites itch! I originally tried putting bandaids over bug bites so that my children wouldn’t scratch too much and make the bites bleed. It turns out that these help the itching as well. I’ve heard a theory that if you cut off the air to the bite it stops the itching. I don’t know why, but it appears to be true. My main suggestion is to try not to get bitten, but if you do, I recommend toothpaste on the bite. Green Your Vacation – Go Camping! Greening Your Camping – Reusable Dishes or Disposable? Just a quick note to let you know your content is being stolen. You may want to follow-up on that too if you’re not affiliated. CarbSane, thank you very much for the pointers. We are aware that EcoFollower publishes our posts periodically, and we are ok with this because they properly give credit to us and our blog and link back to our blog. We were not aware of the other site and we will follow up with them because their site publishes content from blogspot and gives the appearance that it is original content. This is violation of our copywrite. I’ve been told that a pure aspirin dampened and rubbed on the bites also works exceptionally well. The scotch tape is interesting – I wonder why on earth it works? Toothpaste can help lessen the itch but if you rub eucalyptus oil on the itching area, then you’ll probably feel an instant relief. I don’t know if this works but I have been getting emails about Bounce Sheets and that among many things they will keep mosquitios and bees away. Has anyone tried it yet? MissD, we don’t keep dryer sheets around our house anymore, we use vinegar as a fabric softener and we’re trying to cut down on chemcials we use. I’d be curious to hear if it works for you! If you put germ x or any kind of hand sanitizer on the bite the pain and itching will go away! Works like a charm every time, unless it’s a bad bite where the mosquito sucked a lot of blood. (It will work for a little while but the itching will come back.) But it’s good when in a pinch and we’ve run out of hydrocortisone cream.